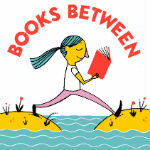 Hi and welcome to Books Between - a podcast for teachers, parents, librarians, and anyone who loves middle grade books. I believe in the power of stories to help us realize that we are not alone in the world. And my goal is to help you connect kids with those incredible stories and share inspiring conversations with the authors and educators who make that magic happen. I am Corrina Allen - a mom of two, a teacher of 22, and gearing up for my Spring Break next week! This is Episode #47 and today I’m sharing three books about the challenges and realities of family life, and then I’ll share with you a conversation with Jen Petro-Roy - author of P.S. I Miss You. A few quick announcements before we get started - the April Middle Grade at Heart Book Club pick is The Parker Inheritance by Varian Johnson and the May pick is Every Shiny Thing by Laurie Morrison and Cordelia Jensen if you want to adjust those TBR piles so you can join us. Kat’s school psychologist - Olympia Rabinowitz. I just loved her gentle way of slowly helping Kat release herself that her mother had a problem. Early on, Olympia comes to her classroom for something like a sharing circle and later Kat writes her an email about her mom. And then deletes it. I thought that was such a truthful moment - because especially for children, sometimes even acknowledging a problem is overwhelming because the consequence of telling is often also bad. There’s a real chance that Kat could have to leave her mom and go live with her dad and his new wife and son - which she does NOT want to do! And like a lot of kids, she has an aversion to airing her family's “dirty laundry.” Plus - I loved Olympia because has jelly beans in her office and that’s always a plus. Have I mentioned that I am a sucker for books featuring food? Oh my gosh - this book had me DROOLING over all the recipes that Fizzy tries out. Like lasagna and apple tart and this intriguing German dessert called Eis and Heiss (meaning ice and hot) which is a mix of cold ice cream and hot fruit sauce. And then later, when she finds out that her mom’s boyfriend, Keene, likes her baking, she makes cake after cake - pineapple upside down and red velvet and this gorgeous purple cake with purple flowers all over it...ahhh. Oh - and this wonderful thing called Benedictine that Fizzy’s Aunt Liz makes for her when she comes over. It’s this wonderful-sounding cucumber and cream cheese spread. I NEED to try this! All the analogies and descriptions related to food. As Jarrett Lerner mentioned on a recent episode, a fabulous analogy can make your writing just sparkle. And boy does Payne fill her writing with sparkling moments. Like, “In a voice so sugary I could practically feel a cavity coming on.” or “And if Mom was starting fresh, then that made me a kind of leftover, didn't it? ", "Here's the thing about leftovers: Nobody is ever excited about them; they're just something you have to deal with." and here’s one of my favorites from page 190. Her friendships with Zach and Miyoko. Zack is a boy who Fizzy’s mom describes as “slick” but who you realize is coping with his own “stuff” by telling adults what they want to hear - and then doing what he wants to do. And then Miyoko - who does exactly what the perhaps over-protective adults in her life want her to - from getting straight A’s to going to bed at 10 - even when she’s having a sleepover! But who stands up for things when it really matters. I really enjoyed Fizzy and Miyoko and Zach‘s supportive friendship with each other. C.C. Payne’s The Things About Leftovers is so well-written - a bittersweet mix of heartbreaking and heartfelt and humourous, and with an ending that is both honest and hopeful. As a kid who went through some very similar family dynamics, I think this book is a must-have for your collection. And I’m really looking forward to seeing more from C.C. Payne! The slow, skillful reveal about Carley’s previous life and what happened to land her in foster care. Hunt does not come right out and tell you, but drops a trail of memories. Like learning that Carley used to “go shopping” for her family by diving into Goodwill dumpsters while her mom played lookout. Or when she asks Mrs. Murphy if the lasagna she has planned for dinner is Stouffers or the store brand. Or when she’s shocked that Mrs. Murphy can calm herself down, because her own mother could never do that. Or the times Carley reveals she had to sleep in the bathtub… It just reminds us that a lot of kids - the angry ones, the quiet ones - have those types of stories that if we knew them, would explain so much. All the little things. I can’t pin it down to just one, but… the giraffe stuffed animal, and Tori’s love of the musical Wicked, and her razzing Mr. Murphy about the Red Sox, and all the Murphy boys - Daniel, and Adam, and especially little Michael Eric. And the sign in Carley’s bedroom… The last three chapters of this book - whoa. Prepare to finish this novel in a location where you can cry. And yes, it’s a tear-jerker at the end, but the tears are about the hope as much as they are about the other things that happen. So please don’t let the fact that you might cry dissuade you from reading this book! It’s… earned them. I almost feel like, Carley (and the kids like Carley) deserved that emotion at the end. Our special guest this week is Jen Petro-Roy, author of P.S. I Miss You. We discuss the role of sensitivity readers, the challenges of writing a novel told all in letters, her favorite board game, and of course - her debut novel! One of the things I really appreciated about this story was that it deals with issues that many, many kids are experiencing - like an older sibling’s pregnancy, religious questioning, and Evie slowly starting to realize she may have romantic feelings for her friend, June. I love that kids have your age-appropriate story so they can either see themselves reflected in the characters (and feel like they are not alone) or start to develop some awareness of what their peers are going through. I saw you mention that you used a sensitivity reader. I am so curious about that process - can you tell us what that was like, how you connected with them, and how their advice may have enhanced your story? On a personal note - I just want to thank you soo much for including a positive portrayal of an unapologetically atheist family. I was formerly very Catholic but we are now a non-religious family and it was so refreshing to FINALLY see a character like June who is happy, well-adjusted, and also non-religious. … So, thank you!! As a novel told all in letters - what kind of challenges did that format create for you?